With the controversial rules that surround red diesel, it can get a little confusing knowing what vehicles and machinery we can legally use it in. After a community consultation period, HMRC changed red diesel rules in 2013, to allow operators of tractors, light farming vehicles and agriculture material handlers to use red diesel in their vehicles when gritting public roads. Previously farming vehicles were only allowed to use red diesel for off-road purposes. Only purpose-built gritters were allowed to use red diesel while gritting public roads. HMRC specified that there was a positive response from the public to the proposed red diesel rules change during the discussion. The Deputy Manager for transportation taxes at HMRC specified that making this change is evidence that the organisation understands the desires of rural communities. Since the rollout of the regulations, multipurpose vehicles can now be used to maintain access throughout periods of bad weather. 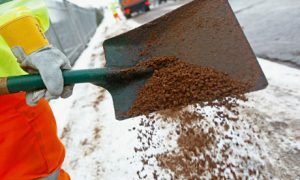 This will bring substantial benefits to people and companies in cities and towns normally outside the range of public gritters. This will allow everyday life to continue and make the roads safer. With the winter months closing in, people in rural areas are pleased tractors and other vehicles can use red diesel as whilst they are gritting roads to improve transport links in bad conditions. HMRC acknowledged that these are frequently the most appropriate vehicles for ice clearance and gritting in isolated areas and it consequently makes sense to allow them to use red diesel as a type of fuel. Farmers were formerly prevented from using tractors and additional agricultural vehicles – which are typically fuelled with red diesel – to react swiftly to adverse conditions.